On Tuesday the finest footballers on the planet were over 8,000 km apart but with the same mission. Qualify for the 2018 World Cup. Cristiano Ronaldo and Portugal would be up first, an undercard for the heavyweight tilts in South America to follow. They wouldn’t disappoint, controlling a previously unbeaten Switzerland to march past them in the group and secure an automatic spot next summer in Russia. Darkness had long since fallen on Lisbon when Lionel Messi and Argentina arrived at the Estadio Olimpico Atahualpa in Quito to play an Ecuador team 2,850 metres above sea level. Sitting sixth in the incredibly competitive South American qualifying group they knew a win was the only thing they needed to secure qualification themselves. While Ronaldo and Portugal faced relative minnows in qualifying - aside from Switzerland - the past two years they have still impressed as a unit and have built a truly strong side that has learned to lean less on the World Player of the Year. Ronaldo remains their biggest threat by some distance but finding a shape that requires him to work less defensively while allowing the likes of Bernardo Silva, Andre Silva and William Carvalho to blossom has allowed them to evolve and improve significantly as a unit from the team that won Euro 2016. Argentina can only dream of finding such a cohesive group. Since qualifying started two years ago they have been a mess on and off the field, going through three head coaches and three presidents, trying over 40 different players and 17 different starting XI’s in 17 games. They remained nowhere close to the perfect formula before arriving in Ecuador. Take Messi out of the team and they lose any sense of quality, winning just one of the eight games he didn’t play in qualifying. Ecuador kicked off and did exactly that. Messi hadn’t kicked the ball before Romario Ibarra slammed home an opening goal after 38 seconds. The footballing world held its breath. Images flashed in our minds of the greatest competition in sports being played without the greatest player. Argentina – scorers of two goals in five games, a penalty and an own goal, in 2017 now needed two. No Argentine other than Messi had scored in almost a year and suddenly not qualifying for the World Cup for the first time in 48 years looked a real possibility. They had spent two years trying to do the right thing by assembling a team with a real collective balance but in the end just threw names on the wall hoping they would stick. Even those that did reacted poorly to going a goal down. Senior internationals playing for big club teams like Sergio Romero, Nicolas Otamendi and Javier Mascherano panicked as Ecuador piled on more pressure. Argentina were on the ropes and had only one knock-out punch left. Up stepped Messi. 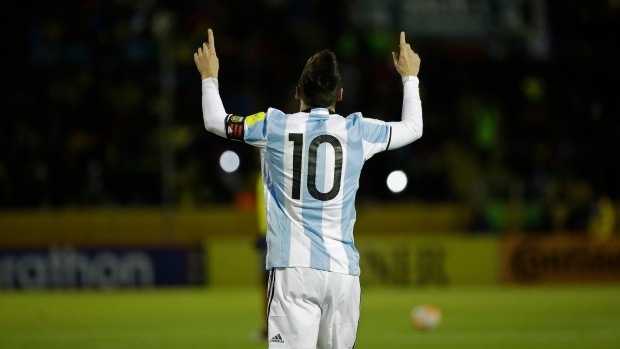 While past opponents have sat deep and rightly believed Argentina weren’t good enough to break them down, a transitional Ecuador team played on emotion, leaving space that Messi could exploit and after 12 minutes the visitors were level, finished by the outside of his majestic left foot after a 1-2 with Angel Di Maria. Eight minutes later the two combined again as Messi took advantage of some nervous defending to put his team ahead. It was still too early for anxiety to disappear and Argentina continued to look like a team devoid of any assurance and control. As millions watched on desperate to see Messi in Russia the only time they could relax was when number ten himself had the ball. They may well have been playing in their famous light blue and white stripes but when Messi wasn’t close to the ball they looked nothing like a team synonomous with success. At times it was like watching a side at your local park who always had that one standout player who looked like he was just playing down a level for fun. Except, this was a night devoid of fun. It was too tense for that. That was until the 62nd minute when the magician dribbled into the penalty box, shrugged off the defender and lifted the ball over the goalkeeper. It was a truly magnificent goal giving Messi his first-ever World Cup qualifying hat trick and his team a place in Russia 2018.
International football will never again be able to come close to the quality offered weekly by the top European club teams but this has been a dramatic qualifying campaign that offers true promise of a really competitive and exciting World Cup. However, Cristiano Ronaldo and Lionel Messi simply had to be there for it to have any chance of greatness. Yes, brilliant players in years past have missed the World Cup but at this stage of the international game it needed to have its megastars in Russia and they both secured their tickets on the same day. It wasn’t too long ago that many assumed Ronaldo would never have a chance of winning the World Cup but Messi, in the shadow of Diego Maradona and 1986, had to in order to truly be considered one of the greats. Now their roles have reversed. One will go to Russia with a very powerful side having shown what the benefits are of building a team at this level, while the other has simply carried his nation on his back and over the line to qualify. Time can be a great healer and more time under Jorge Sampaoli will certainly help but Argentina have much work to do to truly be considered serious contenders next summer. Many words will be written and spoken about that in the months to come but what can never be overlooked is how on this night arguably the greatest player of all-time had his moment. The moment many casual football fans demand every four years, asking him to win a World Cup, at this stage looks as delusional as ever with the group assembled around him. On Tuesday night, though, he has his own Maradona moment, guiding this average team to the World Cup with a truly astonishing, individual performance.